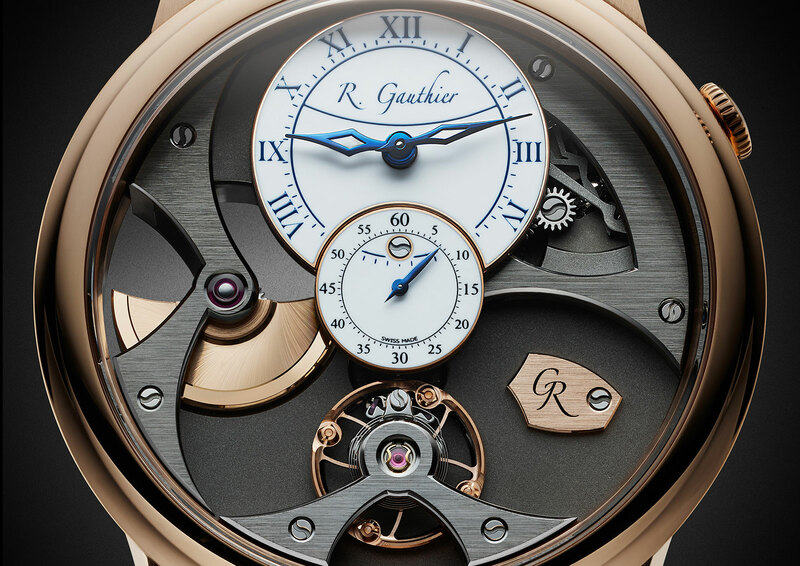 Similar in function to the Laurent Ferrer Galet Micro-Rotor, the Insight Micro-Rotor is Romain Gauthier‘s most conventional wristwatch to date, but executed to the high standards of decoration that’s typical of the brand. 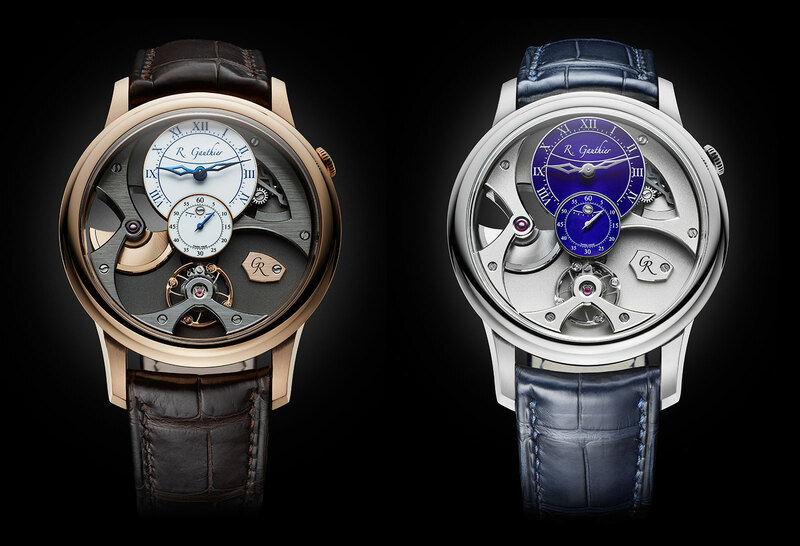 Just launched at Baselworld 2017, the Insight Micro-Rotor is decidedly traditional in colour and style compared to the Romain Gauthier’s last new launch. Measuring a manageable 39.5mm in diameter and in either gold or platinum, the case has a conventional crown for winding and time-setting at two o’clock (instead of back-winder crowns or pushers as in his earlier works). The time display is laid out in a vertical line, with the hours and minutes at 12 o’clock, with the seconds just below. Both sub-dials for the time are covered in fired vitreous enamel, available in blue or white. At six o’clock sits the free-sprung, adjustable mass balance wheel. 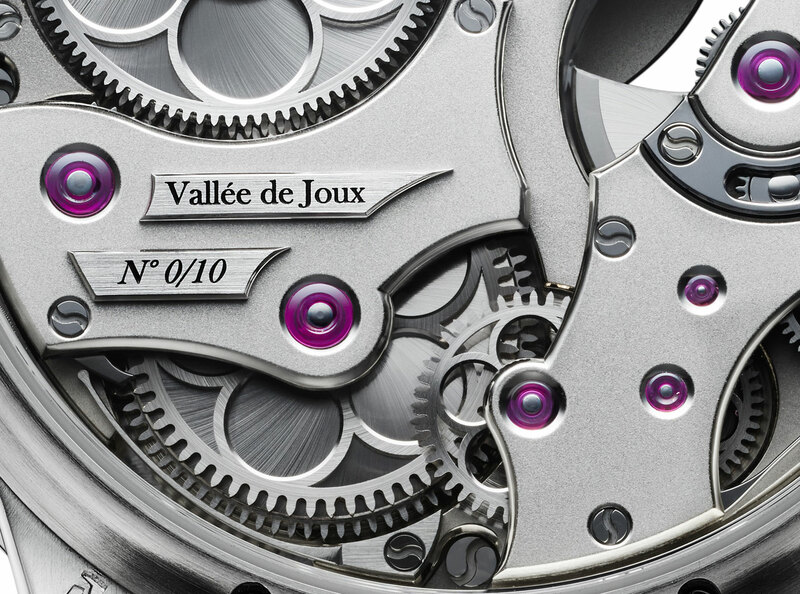 The movement is self-winding, thanks to a micro-rotor visible at nine o’clock on the dial. Pivoted on both the dial and back, the micro-rotor is made of 22k gold, and winds twin mainsprings. 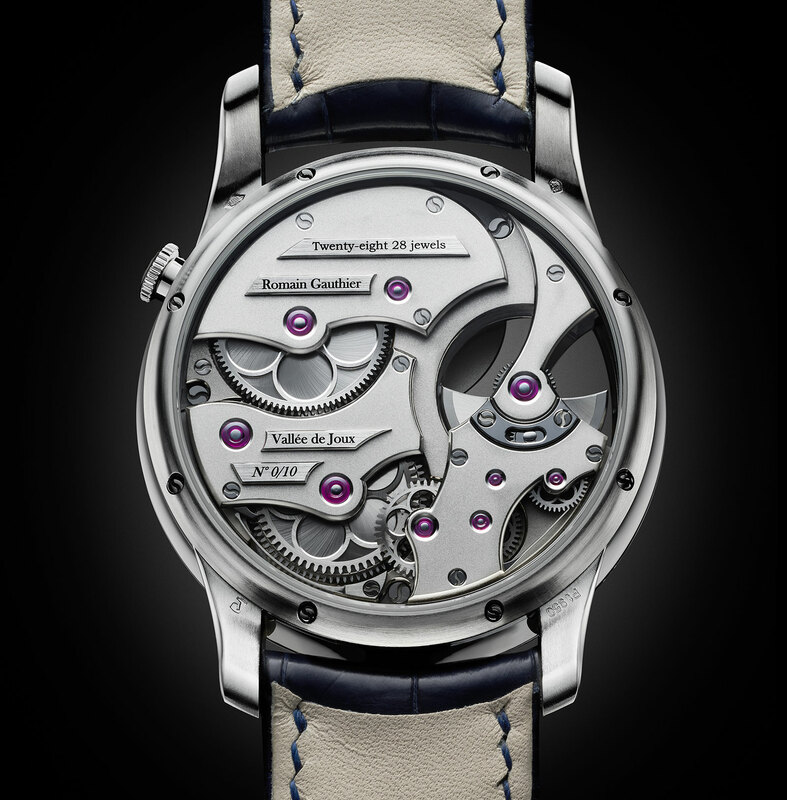 Both barrels can be seen on the left half of the movement from the back, and together they provide an 80-hour power reserve. All the movement finishing is hand-applied, and done impeccably with broad, polished bevels on the bridges and countersinks. 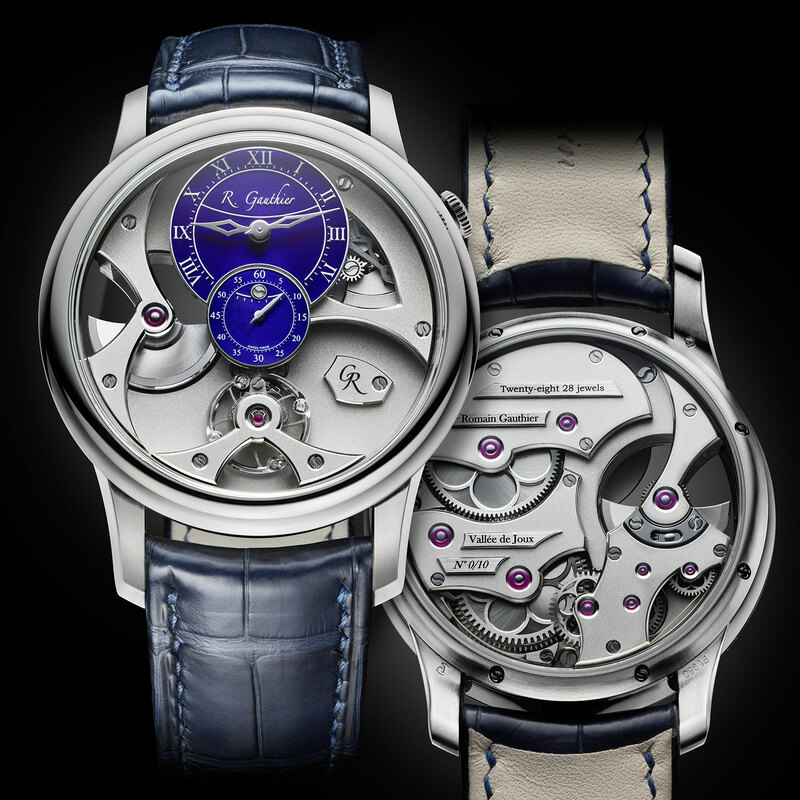 The wheels inside have circular spokes reminiscent of flower petals, while the screws have S-shaped heads, both Romain Gauthier signatures. While the platinum version has rhodium-plated frosted bridges, the red gold version has linear graining on the ruthenium-plated bridges. The Insight Micro-Rotor is a limited edition of 30 each in red gold or platinum, with 10 pieces per dial type for each metal. It is priced at SFr75,000 (about US$75,200) in red gold and SFr88,000 (equivalent to US$88,200) in platinum.